What do you do after your first Blu-ray player receives awards from nearly every publication and web site that pays attention to such things? Where do you go from there if you are a small company that doesn't roll out new models every nine months? That's the question that OPPO Digital was faced with after their BDP-83 proved tremendously successful throughout 2009 and 2010, becoming one of the benchmark hardware platforms for equipment reviewers and the favored player among enthusiasts. By January 2010, the BDP-83 platform had spawned two other products: the BDP-83SE, which upgraded the analog audio section and power supply but otherwise retained all of the BDP-83's internals and chassis, and the BDP-80, which cost over 40% less by dropping the aluminum faceplate, Anchor Bay video processing chip, dedicated stereo analog output, top-of-the-line Cirrus audio DAC, and backlit remote control. That doesn't even consider the other companies that had licensed the platform for much more expensive Blu-ray players. The platform had also seen performance refinements and even new features such as DLNA support, pushing the hardware's capabilities as far as OPPO's programmers and engineers could. Still, by the end of 2010, the Blu-ray player market had seen significant changes both in price and features, something that OPPO Digital had to consider. Streaming media support was becoming standard on entry-level players, even if not everyone wanted that capability. 3D support (and HDMI v1.4) was entering the market place, whether or not consumers wanted to invest in new TV's and wear active shutter glasses. Neither of these features could be supported by the BDP-83 platform's hardware. The solution was to look to a new model with new hardware, something that they started developing back in 2009. We now know that new hardware as the BDP-93. The design paid some special attention to both the need for streaming media support and the peculiar challenges of 3D-imposed HDMI v1.4 hardware support, which I will touch on the First Impressions portion of this review. As with a number of previous players from OPPO Digital, I had the honor of assisting in the beta testing phase of the BDP-93's development. In the past, I have written reviews as that beta process progressed and posted the reviews on the day that the player was launched, but this time work and family kept me from writing this review as we went. That is why this review is appearing a few weeks after the player was publicly released. Visually, the BDP-93 is a bit of a departure from the BDP-83. I feel that the BDP-83 is a pretty classic design. (No industrial design can please anyone, of course, so your mileage may vary.) It helps that so many Blu-ray players have been uninteresting blocks of plastic, but the BDP-83 design was a good mix of form and function. Where did that leave the BDP-93? I initially liked it even more than the BDP-83. Some of that may have been a "newness" factor, as I had been using the BDP-83 on a nearly daily basis for close to 22 months when my BDP-93 beta sample arrived, but it was not solely the "new toy" factor. After a few months, I still like the BDP-93's design a lot, although I think the BDP-83 continues to hold up well. Aesthetics aside, the BDP-93 also does a few things that I really like and think are worth mentioning. First, the aluminum faceplate integrates with the loader and front panel display in a way that merges the metal and plastic materials pretty gracefully: it frames the front panel components in an uninterrupted expanse of aluminum. The loader is centered, which gives a pleasing balance, and to accomodate that the display is split into two pieces: one for the alphanumeric display, and one for the various logos, icons, and other symbols that can provide useful visual cues. Even after quite a few months, I still like this arrangement. The BDP-83 used a directional pad for front panel controls. This is a design feature that I really liked when it first appeared on the DV-980H and initially missed on the DV-983H. I still really like it. The BDP-93 retains similar functionality, but with a set of five flush-set buttons. The look is cleaner, but I still think the BDP-83's controls were easier to find and use. Alongside those controls is a front USB port, as with the previous OPPO Digital Blu-ray players. It is concealed from casual view but still easy to access. The rear panel has a few new tricks up its sleeve, and this is where the design really shows consideration for the new demands being placed on Blu-ray players. The most obvious change is the inclusion of two HDMI ports. Why two ports? 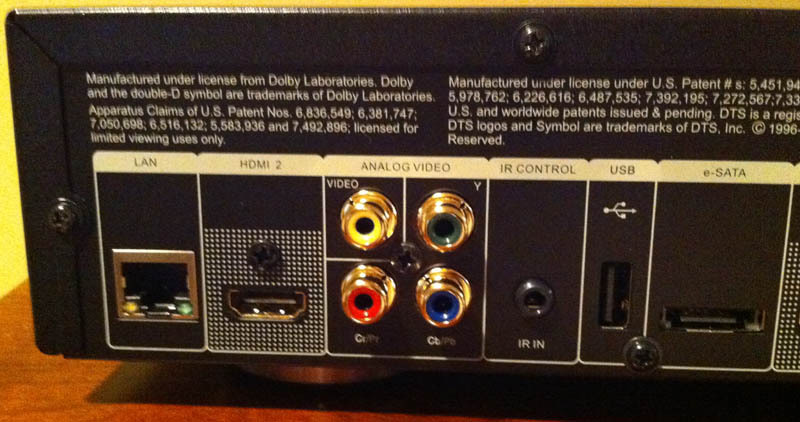 A lot of consumers just got through replacing all of their old Dolby Digital receivers and processors with HDMI v1.3 gear, and now the industry has rolled out HDMI v1.4. Many HDMI v1.3 receivers and processors will be unable to pass a 3D signal through their HDMI signal paths. That means users who wish to deliver a 3D signal to a 3D display will need to either upgrade their receiver or bypass it, sending HDMI directly to the display. (I could spend a few paragraphs here ranting about my issues with the HDMI "standard", but suffice it to say that I use HDMI out of necessity but I do not like it and I am extremely disappointed by the industry's willingness - or even eagerness - to abuse consumers with the clumsy and mis-managed evolution of the HDMI spec over the last eight years and five versions.) 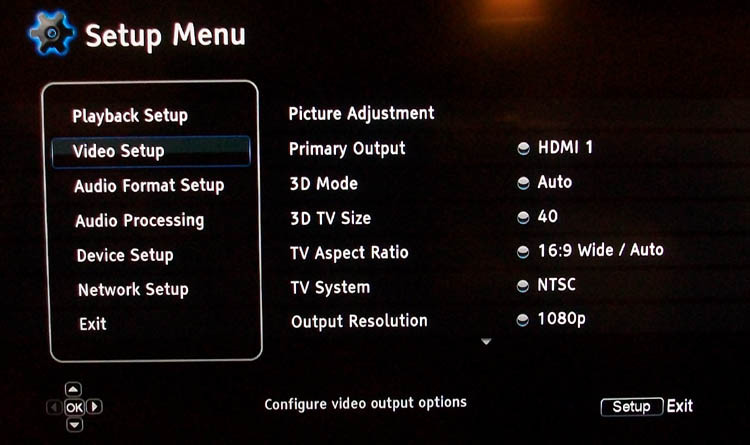 By including two HDMI ports, OPPO Digital has provided a work-around for owners of HDMI gear that doesn't support 3D: the output from HDMI1 can be sent directly to a 3D-capable HDTV as a video output while the output from HDMI2 can be sent to an HDMI receiver or processor as an audio output. 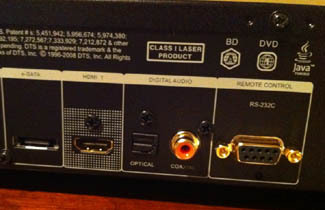 Alongside those two HDMI ports, the BDP-93 also offers a 7.1 analog audio output (for users who still have pre-HDMI receivers or processors), a second USB port, an eSATA port, an IR input (directly compatible with IR distribution systems, unlike previous OPPO players that required special adapters), an RS232 serial port (standard for the BDP-93 rather than the $79 upgrade that it was for the BDP-83), and a good assortment of other video and audio outputs (component video, coaxial and optical digital audio, and composite video). Both the USB ports and the eSATA port support external hard drives, and many people will be pleased to learn that they offer support for NTFS-formatted drives for the first time. The rear USB port (or front USB port) can also host the included wifi adapter, either directly connected to the player or using the provided extension cable. This is another design decision that focuses on the new player features. Where before, the Ethernet port was used mainly for BD-Live bonus content and firmware updates, it now also must support an array of streaming media sources. This increases the number of users who will want to connect the player to a home network. Wired network connections are a great solution in many ways - simplicity of setup and speed being two prominent benefits - but many people can't get network cables to their entertainment centers. For those people, wifi is preferred, and streaming video requires a reliable wifi connection. An internal wireless adapter would have to rely on an antenna that was either completely internal to the player or attached to the rear panel. Internal antennas would suffer from signal degradation caused by the player's substantial metal chassis, moreso than less expensive players that use lighter gauge metal and have plastic faceplates. Rear panel antennas could interfere with wiring and would still have limited placement flexibility. By using an external USB adapter and providing an extension cable, OPPO allows the antenna to be outside the metal chassis and even be located several feet from the player, enabling users to position it for optimal signal strength. There was one last notable change from the BDP-83 to the BDP-93: the video processing chip. Rather than employ the familiar and well-regarded ABT2010 or its new cousin the ABT2015, OPPO Digital opted to use Marvell's latest QDEO solution. As with the wifi adapter, this change was due in part to the need to support streaming video. Marvell's QDEO algorithms offer comparable performance relative to the ABT2010 for most things, but it is superior when it comes to noise reduction. Anchor Bay felt that noise reduction was of little real-world value when dealing with DVD and Blu-ray source material, an opinion that OPPO Digital shared and that the DV-983H and BDP-83 supported in real-world use with thousands of consumers. Streaming video sources are a different matter, however, and thouse sources demand more aggressive compression than either DVD or Blu-ray. That makes noise reduction at the video processor more important. Before we move on to setup, I'll take a moment to make a last few observations. First, the remote control will be familiar to owners of the BDP-83 or BDP-80, as it is the same backlit remote used on the BDP-83. Second, the packaging is also carried over from previous Blu-ray players: a heavy fabric bag to protect the player, a stout black cardboard box to house the accessories (including a good HDMI cable), and a well-written user manual that is an all-too-rare example of excellent, useful documentation. The "SoC" (System on Chip) processor at the heart of the BDP-93 is a new, OPPO-customized chip provided by Mediatek, but it shares lineage with the Mediatek chip used in the BDP-83 and BDP-80. 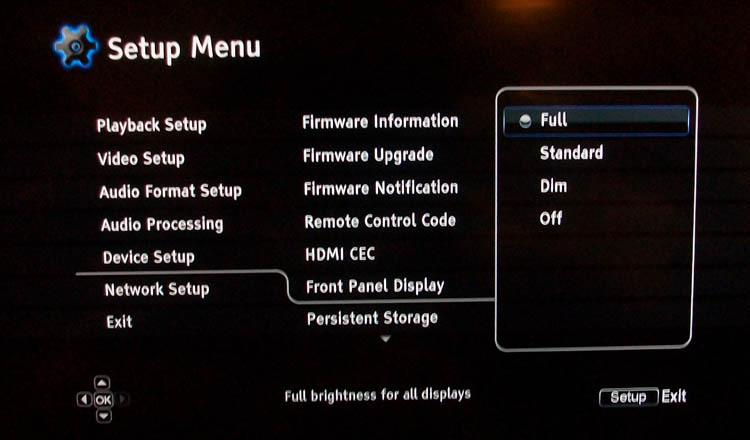 As a result, the setup menus look very similar to those seen on the previous OPPO Digital Blu-ray players. The first time you turn the player on, you will encounter a Quick Setup Wizard with six screens that will walk you through the most fundamental settings for the player. While many menu settings will be left at their default values after this wizard, the most critical ones will all be adjusted as necessary and most users will be able to start using the player immediately, if they want to. Primary video output, resolution, and audio processing settings are all handled with just a few questions in the wizard. In general, it is still a good idea to visit the player's setup menu. The BDP-93's manual offers a good explanation of the features and functions contained within the player's menus. 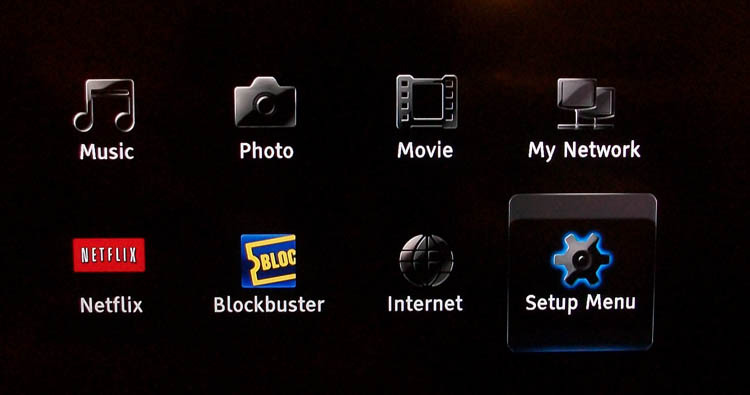 Some commonly-used functions will require a trip into the setup menu, such as enabling 1080p/24 Blu-ray playback, configuring the wireless network adapter, setting a static IP address rather than relying on the default DHCP-acquired address, or configuring bass management for the analog output. As for that last item, the BDP-93 has two new tricks up its sleeve. 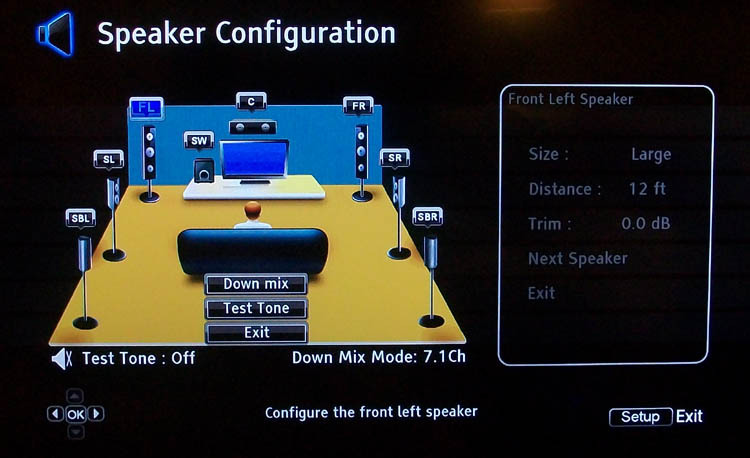 First is the ability to set the crossover point used for small speakers. 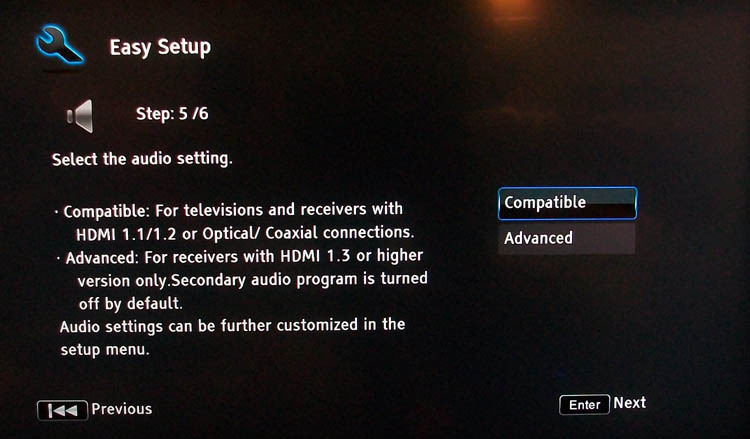 On previous OPPO Digital Blu-ray players, the crossover was fixed at somewhere between 80Hz and 90Hz. This approach is common on disc players, and many even use a higher crossover point (anywhere from 100Hz to 120Hz) that is often undesirable. The BDP-93 gives you the ability to select a crossover point that's best suited to your system. While you are setting that crossover point, you may also need to set speaker distances and trims. That's where the other new trick comes in, as the BDP-93 offers internal test tones for use in setting channel trims. There are a couple of default settings that I have taken to changing each time I reset the player to factory defaults (a common event when beta testing). One is the screen saver under Video Setup / Display Options, which I turn off. Another is the front panel display under Device Setup, which I change from standard to full. I make that last change because it causes the right portion of the front panel display to remain active at all times; the icons shown on that display are typically too small to read from my couch, but they can be handy diagnostics at times. A few months after the BDP-83 was released, I created a series of setup guides that were geared toward owners of Outlaw Audio surround processors and receivers. This was based on requests from several people on Outlaw's company forum because of the fact that most of Outlaw's processors and receivers have provided some form of bass management for their multichannel analog inputs (a non-standard arrangement that requires setting the player up differently than is described in the player's manual). I have created a revised set of guides for the BDP-93 and those same Outlaw products. 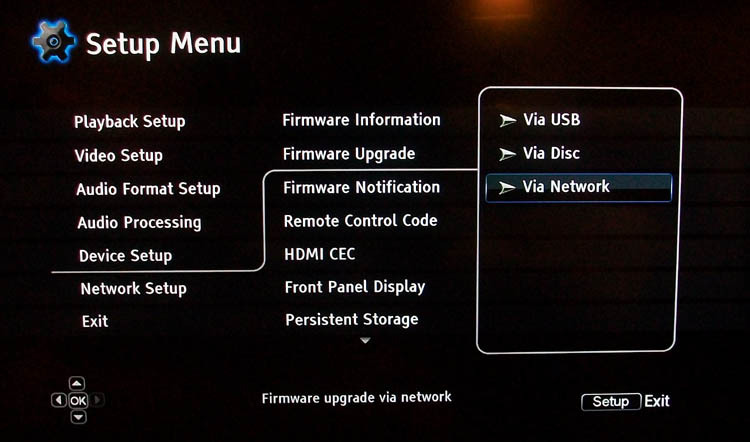 Prior to writing a review for my first OPPO Digital DVD player (the OPDV971H back in May 2005), I hadn't ever said anything about firmware updates in a player review. Since then, it has become a standard part of my player reviews, and over the last five years or so OPPO Digital has refined the ways they allow users to update firmware quite a bit. You can still burn firmware to a CD-R and load it that way, but the BDP-93 also supports updating via USB and via a network connection. I talk at some length about this process in my BDP-83 review. The BDP-93 works the same way as the BDP-83 and BDP-80 do when it comes to firmware updates. While the file size for the main firmware has increased, the process is still quick and easy. I've updated firmware on the BDP-93 more than 20 times, mostly via USB but also by network several times. It is a process that users need not be worried about. Support for services like Netflix has become a priority for many people buying Blu-ray players. While the BDP-83 ended up supporting network file sharing via DLNA, the hardware capabilities were limited. The BDP-93 changes that. At launch, the BDP-93 supports Netflix, DLNA network, and several other services. I spent a fair bit of time tinkering with Netflix during beta testing as well as a little time with DLNA. DLNA support is similar to what was offered on the BDP-83 and BDP-80, although the file support has changed somewhat. The user manual covers the full array of supported audio, video, and image file formats, with some help from the official Wiki site. The new file support changes that I think are most notable are WAV and FLAC audio files, both of which provide a way to achieve lossless audio via DLNA. At present, the FLAC ID data is not displayed like the ID3 data in MP3 files, so both FLAC and WAV files will only show the file name in the "Now Playing" screen. Unlike DLNA, Netflix was a service that never appeared on the BDP-83 or BDP-80. My experience with Netflix's streaming service had been limited to watching on a PC and using the Nintendo Wii Netflix disc. The Netflix service is accessed using an app that essentially takes over the player, preventing the user from accessing the player setup menu or the on-screen display. This also means that the interface looks very much like the interface on other Netflix-enabled devices, since Netflix retains significant control over it. 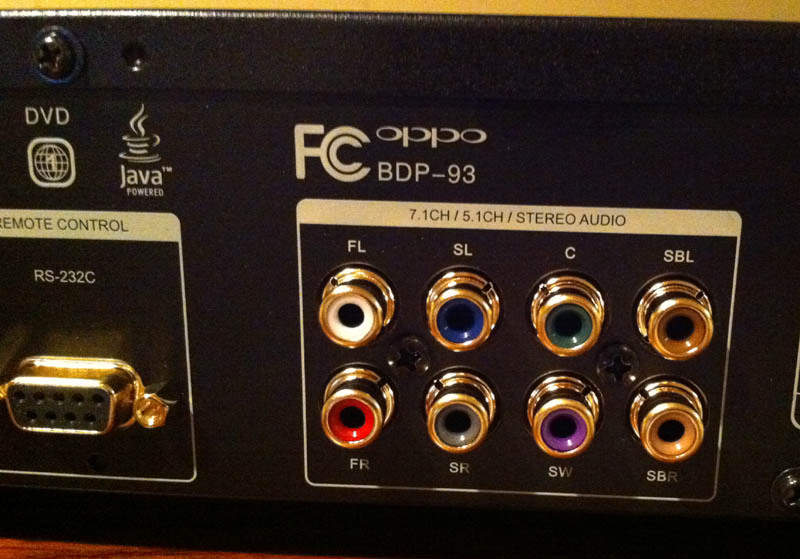 I watched a number of standard and HD programs through Netflix using the BDP-93. The standard programs were clearly more compressed than a typical DVD, but the results were serviceable and the Marvell processing seemed to help tidy the video up. HD programs were more on par with a decent DVD transfer. For a lot of movies, I still prefer to have a good Blu-ray to watch, but for things like TV shows, kid's cartoons, and the like, it's a handy service to have. Based on what happened with the BDP-83, I suspect that we may see additional services added to the BDP-93 via firmware updates I will end up revising this section of my review at some point. Part of me thinks that it was this section and the next section of the review that were responsible for my procrastination in writing this review - not due to any fault, but because it all seems so familiar. What do I say about the BDP-93? The design objective was to match the BDP-83's performance for video (DVD and Blu-ray) and audio. I could spend a few paragraphs looking in-depth at test patterns and trying to quantify the player's performance relative to that chosen benchmark. Plenty of other reviews will provide just that, written by people with more detailed video know-how than I can offer. My BDP-93 functions mainly as an all-purpose disc player, with a mixed diet of Blu-ray, DVD, and CD discs. For Blu-ray as well as DVD, it has been able to comfortably step into the space previously filled by the BDP-83. That says something for anyone who has spent time with the BDP-83. I will also note that layer changes on the BDP-93 have been very responsive. My standard test discs for layer change have performed as well as I could hope. At various times in the testing, I used HDMI2 (the output that does not get its output from the Marvell QDEO chip), HDMI1 (the output that does get its output from the Marvell QDEO chip), and HDMI1 for video with HDMI2 for audio. 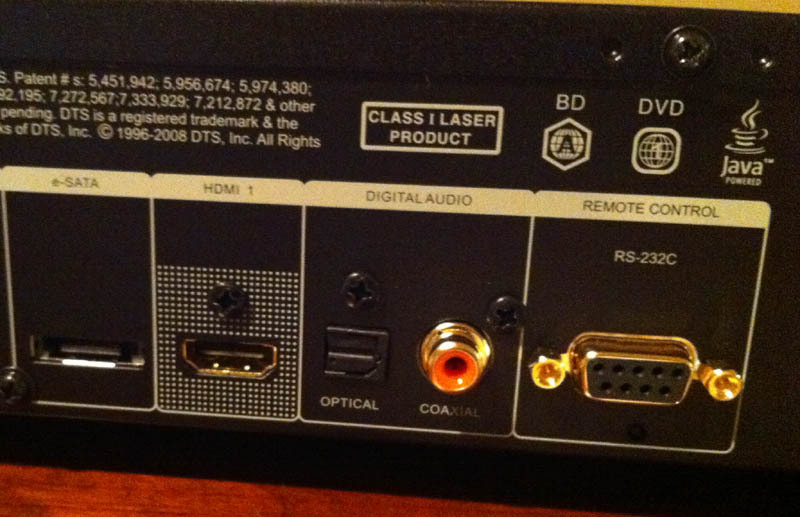 The one thing to consider when using both HDMI outputs is that HDMI v1.3's automatic AV sync will not work when the audio and video signals are separated - manual adjustment may be necessary in some systems. Also, 3D is not a priority for me personally, and as a casual user rather than a profesisonal reviewer I have not invested in a 3D display. As a result, I have not used the BDP-93's 3D capabilities. 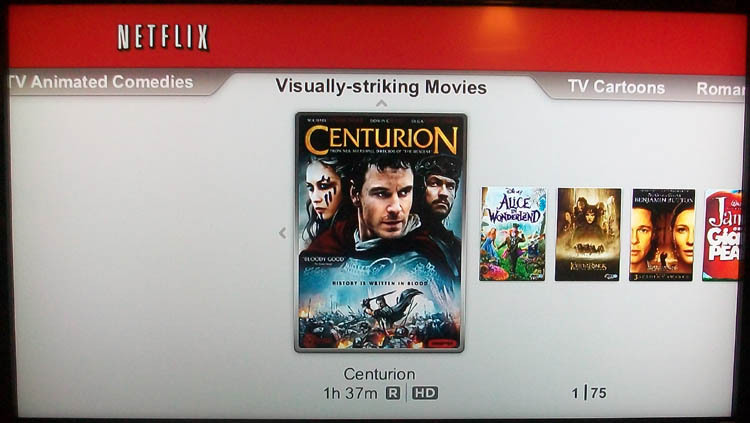 I mentioned earlier that I had spent some time with Netflix. The source material is obviously the main limitation, but the BDP-93 acquited itself well with the streaming video source. The BDP-93's audio performance is actually a bit easier to explain, at least for me. First, the audio processing is refined and upgraded thanks to the additions of a user-adjustable global crossover and test tones, both really great features to have in a player with a truly worthwhile analog audio section. Second, the BDP-93 achieves something that the BDP-83 did not: when internally decoding lossless audio from Blu-ray discs, the BDP-93 can mix in secondary audio streams without being forced to step down to lossy core audio. This means that users who want to make use of secondary audio tracks from time to time (such as on all of the bonus features on HBO's The Pacific mini-series) can set the player to output LPCM over HDMI and leave secondary audio enabled all the time without any sacrifice in audio performance. I will say more about this shortly. In addition to these refinements in audio processing, the BDP-93 offers a multichannel analog audio section that seems to be somehow improved over the BDP-83. A number of beta testers (myself included) have felt that the BDP-93 actually offers a somewhat better multichannel analog audio section. This is no small feat, as I am one of many owners to have been very impressed by the BDP-83's analog outputs. 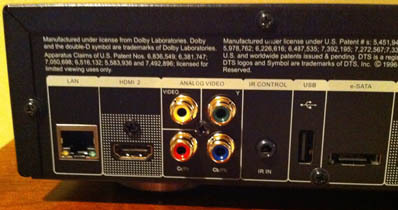 The dedicated stereo output is gone, but the BDP-95 (which is due in February 2011 as a replacement for the BDP-83SE) will offer that dedicated output with both RCA and XLR connectors. Audio format support was one of the BDP-83's claims to fame. It was the first "universal" Blu-ray player to be available to consumers, offering support for SACD and DVD-Audio as well as DVD, CD, and Blu-ray. It also could handle a few audio file formats such as MP3 and WMA, but the lack of support for any lossless audio file formats was frequently cited as a weakness. The BDP-93 retains the much-loved support for SACD and DVD-Audio, but - as mentioned earlier - it also adds support for WAV and FLAC files via both USB/eSATA and local network sources. That additional capability serves as icing on the cake for a video player that doubles as a very robust audio source. While we are talking about handy new audio capabilities, I will toss out one more: secondary audio support. This is something that has always been in OPPO Digital's Blu-ray players, but the BDP-93's new hardware allows the player to mix in secondary audio streams at the same time it is decoding lossless audio (TrueHD or DTS-HD Master Audio). This means that users may leave secondary audio enabled in the menu at all times (assuming that HDMI Audio is set to LPCM or the analog outputs are being used) and the player will always play back lossless audio for the primary audio track. Previous players did not have the processing resources to do this, causing them to revert to the lossy core audio track any time the player had secondary audio enabled. 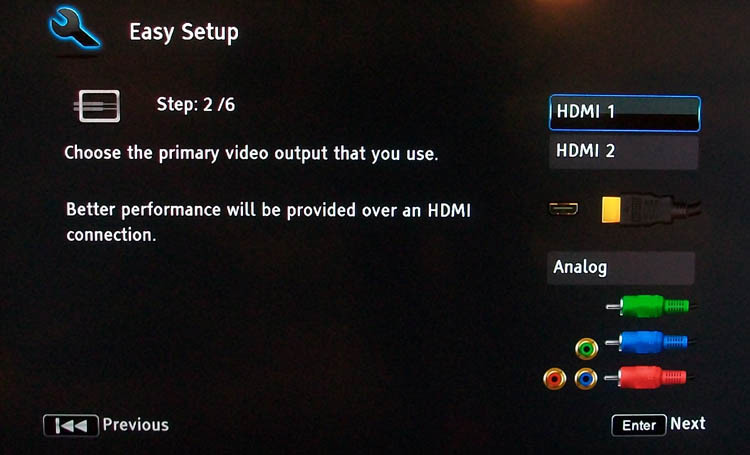 When outputting an audio bitstream over HDMI, users still should leave secondary audio disabled. Enabling secondary audio in conjunction with bitstream HDMI output causes the player to output high bitrate lossy audio. Overall, I think the audio performance on the BDP-93 is a slight upgrade across the board over the BDP-83. It is not to the level of the BDP-83SE, but it shows that there have been some careful refinements to the hardware. Some users will lament the loss of a dedicated stereo output, but in a great many cases those users will be better served by the BDP-95 (with ESS Sabre DAC's at the heart of a more robust analog audio section). In addition to the subtle improvements in multichannel analog audio performance over the BDP-83, audio processing is improved in a couple key areas, and media file support is expanded. This positions the BDP-93 as a very potent audio player. 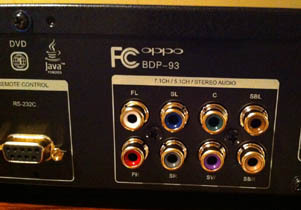 The BDP-83 was discontinued earlier than OPPO Digital intended when a discontinued component halted production of it and both of its siblings (BDP-83SE and BDP-80) in late 2010, but it left some large shoes for its successor to fill. The BDP-93 has now arrived and attempted to step into those shoes. For the first couple months of beta testing, I had both my BDP-83 beta sample and the BDP-93 in the equipment rack together, but the BDP-83 saw less and less use as the BDP-93's firmware matured. Eventually, the BDP-83 was sitting completely idle and I moved it to my stereo system in the living room, at which point the BDP-93 had officially replaced it in our den. Now and for the last months of 2010, it has felt like a worthy successor to the BDP-83. That's high praise. Not only does it live up to the BDP-83's expectations for audio and video performance, but it also finds ways to make practical improvements (WAV and FLAC support, secondary audio with lossless primary tracks) at the same time it integrates new features (Netflix, 3D) and incorporate hardware changes meant to allow users to make best use of those features (dual HDMI outputs, wireless with an external antenna that can be placed for optimal reception). The BDP-93's price tag remains the same as the BDP-83's while these new features are packed inside. That $499 price may look steep alongside 3D players that can be had for as little $150, but if you want all that the BDP-93 has to offer - video performance, disc format support, analog audio performance, connectivity options such as dual HDMI ports and RS232, and the level of customer support that OPPO Digital has become known for - you'll quickly find that $499 looks like a bargain.